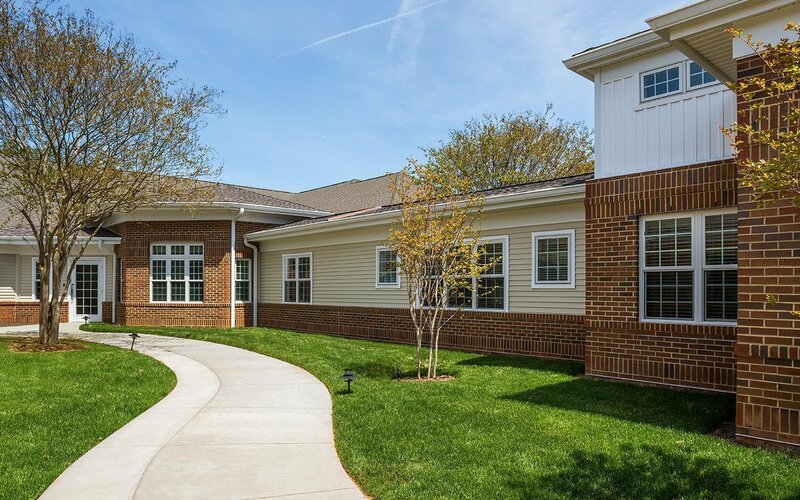 Built in 2003, Cuthbertson Village serves Aldersgate’s assisted living and memory care residents. Originally consisting of three 15-bed households, a master plan developed by CJMW in 2008 called for the addition 16-bed household in response to a growing resident population. The expansion project then became the impetus for a complete renovation of the Village’s commons area – the Town Center. Taking cues from the existing building, the addition is a single story. Patterned brick gives definition and interest to the exterior. 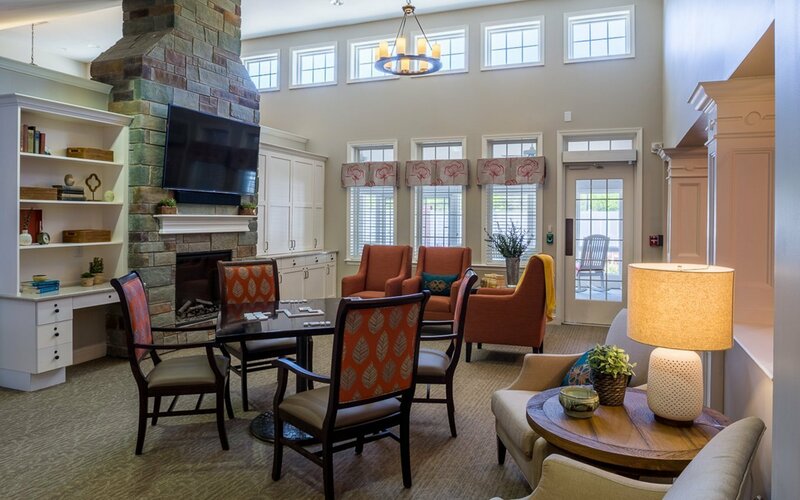 A gated garden with a walking path leads to a screened porch furnished with comfortable chairs and tables so residents can enjoy the outdoors. Inside, the household’s residents can relax in their living room or the lounge/ game area. 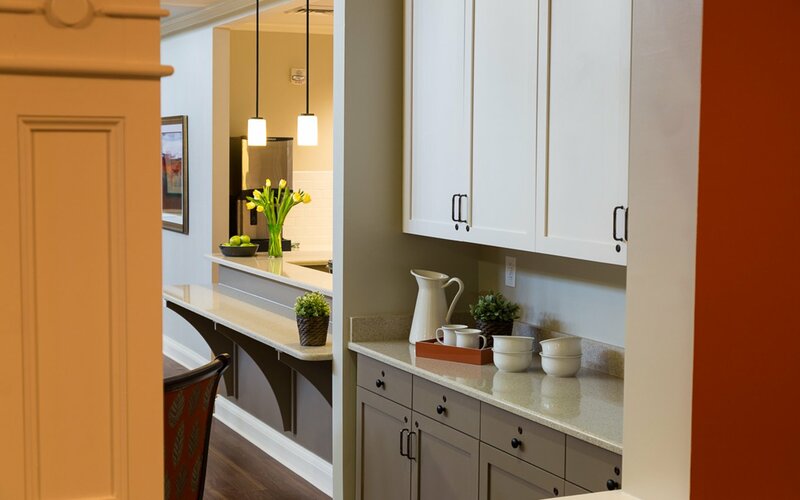 The dining space is served by a prep kitchen that includes a chair height counter so residents can watch or participate in the activity. Throughout, clerestory windows bring in natural light without direct glare. The color palette is rich but simple so as not to create confusion for any residents who may be visually impaired. 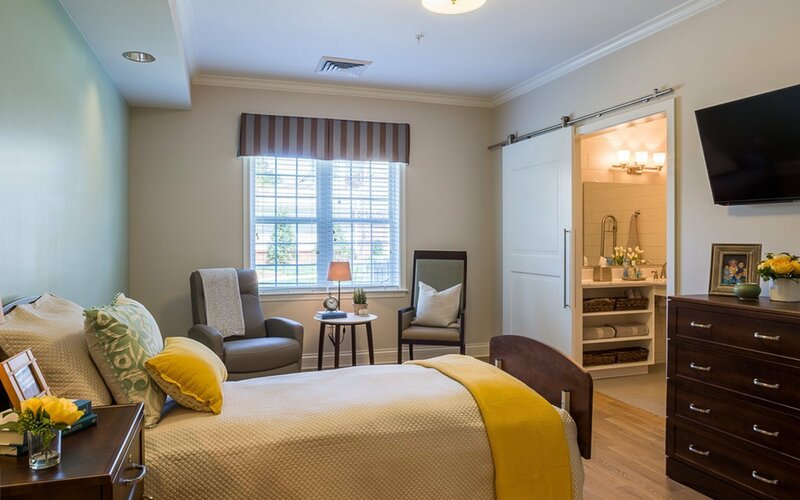 Each resident enjoys a fully-furnished private room and bath. The generous room size allows residents to bring some beloved furniture should they wish to. A decorative medicine cabinet located near the door allows staff to check medicine without disturbing the residents. Sliding privacy doors make getting in and out of the bathroom easy, and the no-threshold euro shower facilitates independence and accessibility. Each household is directly connected to the Town Center, with connection points back into the households from the Town Center uniquely identified to assist residents with wayfinding. Originally conceived as a village square with faux-storefront activity spaces around the periphery of a central skylit area, the Town Center was out-of-date in both appearance and function. 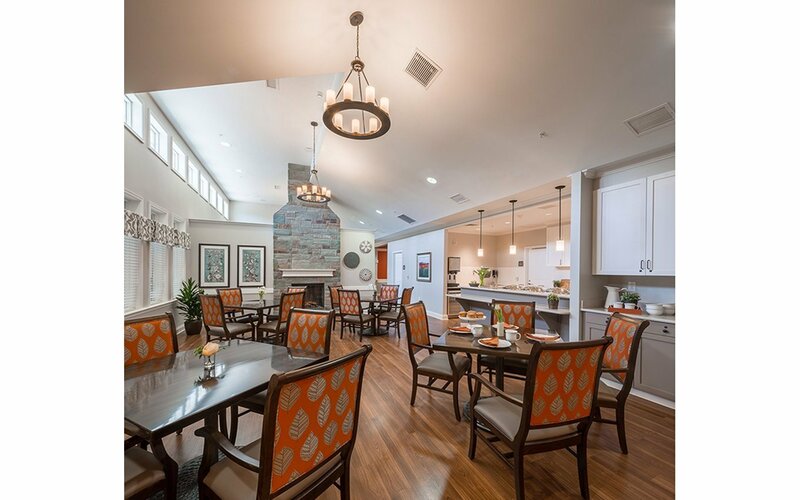 Specific issues included a mismatch of activity spaces to resident needs, difficult acoustics, harsh lighting, and lack of available seating and usable central space. The team’s goal was to design a space that accommodated residents’ needs but didn’t announce itself as a senior environment. 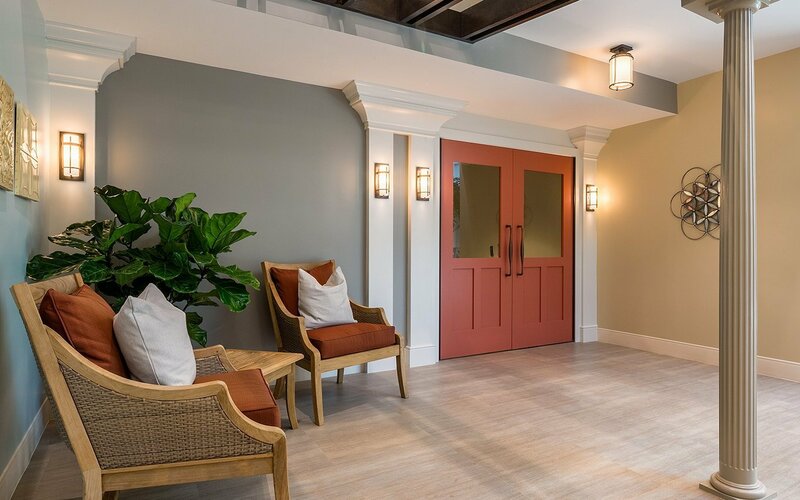 In addition to creating flexible space for gatherings and visiting with friends and family, the team worked with Aldersgate to identify a new overall aesthetic and new uses for periphery areas that would support residents and operations. Changes included a larger salon, a movie theater, and dedicated worship space. A café/kitchen allows a more personalized dining experience throughout the day. 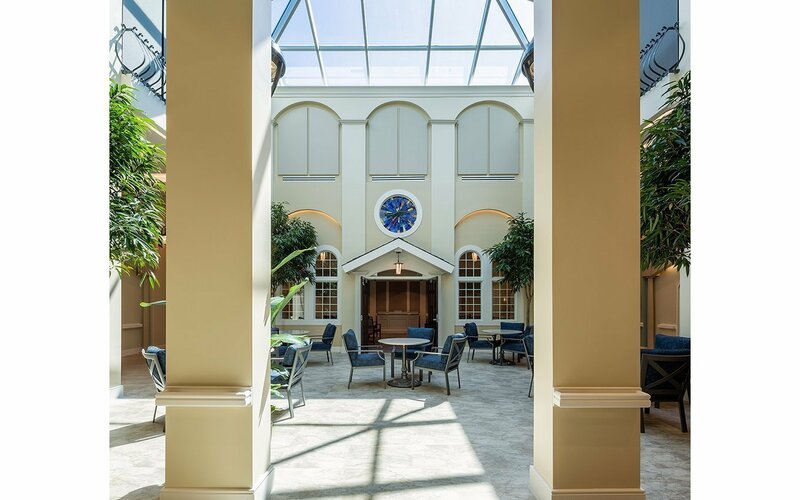 Taking inspiration from the gracious courtyard gardens of Charleston, Savannah, and New Orleans, the space is refocused on the skylit area, creating an ‘outdoor’ garden with comfortable and supportive seating. A colonnade gives definition to the circulation paths. 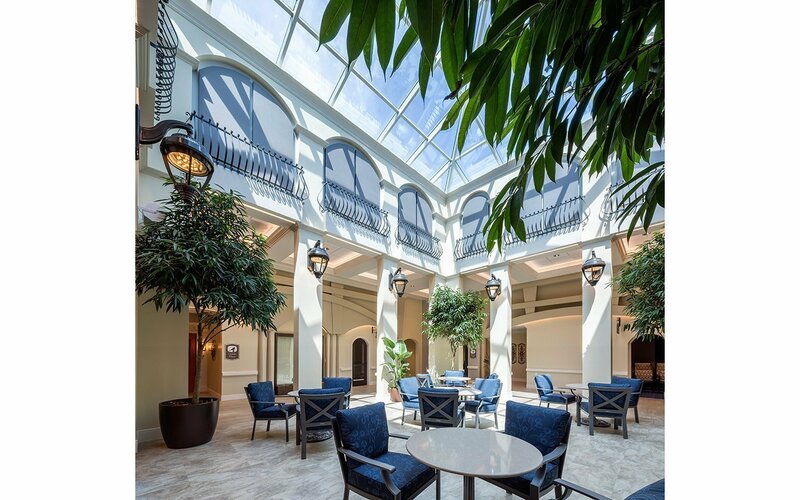 The courtyard aesthetic is carried throughout the space. Details add relief to flat walls. Fabric acoustic panels reference second-story windows while dampening noise. 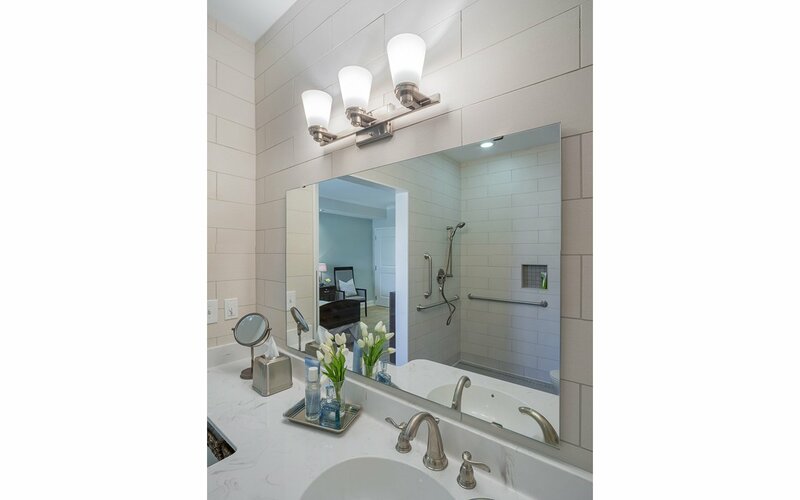 New lighting fixtures offer soft but ample light.